Documentaries | WHAT A FEELING! 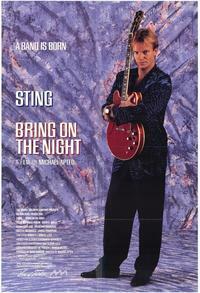 Bring on the Night is, in almost every way, your typical rock documentary. It traces the evolution of a project from beginning to fruition, with heavy emphasis on musical numbers, interspersed with interviews and behind-the-scenes hijinks. Now, if you’ve seen a few “rockumentaries,” you know that the form itself is intrinsically stupid. The things are usually vanity productions designed to indulge the whims of the stars, who often babble on about their philosophies during the all-too-lengthy breaks between songs. Bring on the Night falls into most of those traps, but redeems itself in other ways. The good thing is, it’s about Sting, who happens to be one of the most intelligent and thoughtful rock musicians. The bad thing is, it’s about Sting, who also happens to be one of the most pretentious and least fun-loving rock musicians. The project here is the new band that Der Stingle assembled for his current “Dreams of the Blue Turtles” album, and some touring he did with the band. 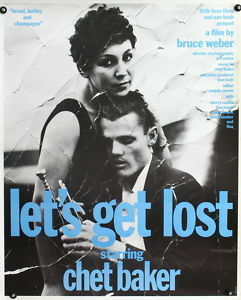 The film, Sting explains at a press conference near the beginning, wants to show the creation of a band—unlike other rockumentaries, which sometimes catch bands at their bitter end (as with the Beatles and Let It Be). The dichotomy between Sting’s intelligence and his pretentiousness makes this process interesting to watch. The musicians Sting has gathered together (in a chateau near Paris) seem deliberately chosen to represent something he’s not—he’s British, they’re American; he’s rock, they’re jazz; he’s white, they’re black. These jazz musicians are a fun bunch, no question about it, while Sting seems to be straining to join in their groove. But at least he is trying, even so far as joining in on a chorus of “Meet the Flintstones” as kicked off by saxophonist Branford Marsalis. The outgoing (and supremely talented) Marsalis presents quite a contrast with the rather aloof Sting. While Sting goes on, somewhat pompously, about his search for a new sound, Marsalis describes how he switched from the clarinet to the saxophone because you could get girls with a sax. Marsalis is no less serious a musician, of course, but he seems to have a healthier sense of humor. 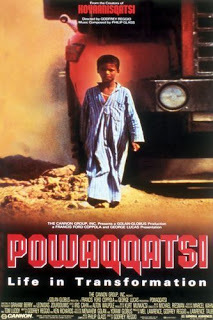 Director Michael Apted (Coal Miner’s Daughter, Kipperbang) shows us the birth of the album, in rehearsal sessions at the chateau, and the culmination of the project, in some live gigs in Paris. We also see another kind of birth: a human one, as Sting’s girlfriend Trudie Styler delivers a baby boy on camera. It’s the music (not the medicine) that sustains the film. The songs take over near the end, and all the forced backstage stuff fades away. Sting is a talented songwriter, and his work is his vindication. The concert’s final song, “Message in a Bottle,” could be a description of the movie itself—a message sense out in the hope that someone will listen. Well, message received—but Sting, next time just sing the songs, don’t talk about them, okay? There were quite a few of these back then. And just a year after This Is Spinal Tap, too. One of the surprises among the Oscar nominations was the absence of 16 Days of Glory in the best documentary feature category. 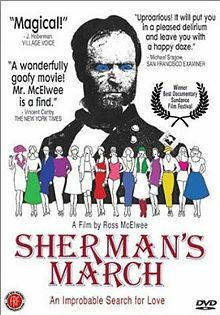 Even among those who hadn’t seen it, the film sounded like a natural choice; after all, the documentary category is usually filled with moves few people have heard of and fewer have seen. 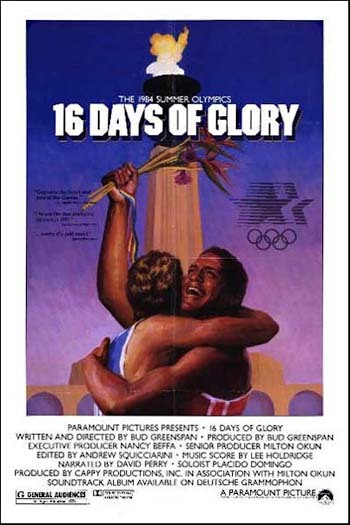 16 Days, on the other hand, was the official record of the ultra-ballyhooed 1984 Summer Olympic Games in Los Angeles. Surely that gave it shoo-in status? Well, ask Cher and Steven Spielberg about shoo-in status. 16 Days of Glory didn’t make it, and now that the film is going into wide release, it’s more obvious why. Competent, well-photographed, and shrewdly constructed, 16 Days is nevertheless a perfectly ordinary sports documentary, no better or worse than the average Super Bowl highlights film. The segments, focusing on individual performers, are only as beguiling as the particular subjects. There are some interesting omissions: Carl Lewis, for example, and the fall of Mary Decker. The opening scenes are rather good—the stadium erupting in a mosaic of flags, created by the cards held by spectators, and the torch passing from Jesse Owens’ granddaughter to gold medalist Rafer Johnson, who slaps the steep stairs in front of him as he hikes the last leg to the top. The first segment is a twist: Dave Moorcroft, British world-record holder in the 5,000 meters, suffers from a chronic pelvic injury that strikes him on the day of the final heat. He gamefully finishes the race, however, in pain and lagging far behind the leaders. The next segment is a heart-tugger. The Japanese Judo master Yamashita is injured during a semi-final match, and visibly limps from the bout. He can’t rest, however, because all the matches take place on the same day. So we see him dragging his bad leg behind him and, somehow, keeping opponents away from it, until he achieves a stirring victory. The triumphs are real, and a tribute to the athletes. Producer-director-writer Bud Greenspan can’t resist the temptation to heighten each contest by emphasizing the odds against the athletes who will win. It’s the oldest sports cliché in the world, of course, much beloved by columnists and broadcasters, and Greenspan is pretty brazen about exploiting it; athletes are portrayed as too old, too slow, or too unheralded to win, but they come through in the final reel. Greenspan has been careful (except, perhaps, at the grand finale) not to turn the film into a bloody show of nationalism, which is no small feat considering what was done to the Olympics by politicians (of every stripe) eager to cash in on the flag-waving. Greenspan makes no attempt to make the film into the kind of visual poetry of, for instance, Leni Riefenstahl’s Olympia of the 1936 games. It’s sheer reportage, with only the occasional stray detail catching the marvelous poetry possible in athletic competition: the reluctance of Rowdy Gaines, expecting the worst, to turn around and look at the results after he has won a gold medal in swimming; the wife of hurdler Edwin Moses doing some hurdling of her own as she jumps onto the track to hug the winner; an unidentified American woman raising her hand to her mouth while on the awards platform, revealing fingernails of wild hue and length. Two more cavils: not enough women (Joan Benoit and the inevitable Mary Lou Retton are the only women who have segments); and the narration, spoken by Daniel Perry, is exactly the kind of overblown hooey that’s been a sports staple for years. How many times do we need to hear, “The athletes entered the stadium like the gladiators of old,” before it can be retired? The slights to Cher and Spielberg were for Mask and The Color Purple. The L.A. Olympics are remembered as Reagan-era patriot games, and indeed everything was wrapped in red, white and blue. You may not recognize some of these names, but most of them were very familiar at the time. Mary Lou Retton was, of course, the Gabby Douglas of those Games, but multiplied by the number of stars in the flag.